Travis Coates has a good head…on someone else’s shoulders. A touching, hilarious, and wholly original coming-of-age story from John Corey Whaley, author of the Printz and Morris Award–winning Where Things Come Back. Listen—Travis Coates was alive once and then he wasn’t. Now he’s alive again. Simple as that. The in between part is still a little fuzzy, but Travis can tell you that, at some point or another, his head got chopped off and shoved into a freezer in Denver, Colorado. Five years later, it was reattached to some other guy’s body, and well, here he is. Despite all logic, he’s still sixteen, but everything and everyone around him has changed. That includes his bedroom, his parents, his best friend, and his girlfriend. Or maybe she’s not his girlfriend anymore? That’s a bit fuzzy too. Looks like if the new Travis and the old Travis are ever going to find a way to exist together, there are going to be a few more scars. Oh well, you only live twice. With Noggin, I really wasn’t sure what I was getting into and I was a little worried that I was heading for a non-Christina book. Would I wonder if I had my head screwed on straight when I chose to read this? Should I just head a possible bad experience off at the pass? (Head them off at the pass? I hate that cliche. Fifty nerd points to anyone that gets that reference.) Low and high expectations were neck and neck. Or I just wanted to make some bad puns to start my review for a surprisingly serious book, because that’s how the head rolls. And scene. As you probably know already, or if you don’t the head puns have probably been confusing, Travis Coates died and woke up with his head transplanted onto another person’s body. Now, you’re probably laughing at this, and I was actually expecting Noggin to be hilarious and reminiscent of say Beauty Queens. That was incorrect. There’s definitely some humor, but Whaley’s taking on serious themes and the book’s definitely not fluffy. Travis Coates was dying of cancer. He’d been through all the treatments and nothing worked, so when a man comes and offers a chance at a new kind of transplant, Travis is amenable. He signs up for the potential body transplant thing, says goodbye to his family, friend, and girlfriend, and his head is cut off to be saved until medicine can actually manage the feat. Fast forward five years and Travis wakes up, what to him feels like no time later. Now Travis’ head is on the body of a guy who died of a brain tumor. Even though it’s a body upgrade (hey, six pack), his life hasn’t been upgraded. His friend, Kyle, and girlfriend, Cate, don’t come to see him in the hospital. His room at his parents’ house is empty of all of his stuff, and now has all the personality of a hotel room. He’s on the news constantly, only the second successful case of this kind and deemed a miracle or a sign of the impending apocalypse. Noggin‘s really about the emotional turmoil that coming back five years later places on Travis. Yes, having a new body is weird, and he thinks about it differently than he did his own, but the real problem is how out of sync the life he knew is from the life he now has. For him, no time has passed. He’s still 16, though his birth certificate says 21. Instead of being at the grown-ups table at Thanksgiving, he’s at the kids’ table, watching some of his used-to-be younger siblings eat with the adults. His girlfriend is now 21 and engaged to some other guy. His gay best friend is dating a girl. Travis doggedly tries to recapture his old life, because it’s the only way he knows how to be. Noggin‘s a surprisingly sad book, in which I spent most of my time wishing I could sit Travis down and give him a talking to. He does so many incredibly stupid things and clearly needs help. I think that’s the one thing that bothers me, though. Other than one meeting with a school guidance counselor and some doctor checkups, there’s no sort of therapy or anything to help him reintegrate with life successfully. I mean, with all that was probably spent on this procedure, why not pay a little bit more to help him mentally adjust? 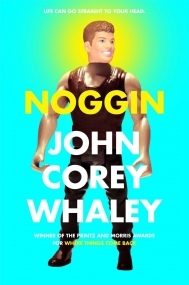 Don’t let the smiling two-tone Ken doll fool you: Noggin’s not a comedy. It’s a real and painful consideration of the way coming back from the dead five years later changed physically but the same mentally would have on a person. This book was hilarious. Normally I don't read book from male point of views, but this book was an exception. I really enjoyed the humor in this book. There was nothing extremely exceptional about the writing but it was still a really enjoyable book. One thing however that I really found neat was how the last words of the chapter made up the title of the next chapter. Now to the actual plot. It really wasn't anything that special. I'm glad Travis was able to rekindle his friendship with Kyle and help Kyle recognize his true feelings. Also I really enjoyed Hatton. Hatton was funny and despite being "not cool" he really made the best out of high school. It really bothered me how immature Travis was when it came to Cate and pining after her. As a sixteen year old myself, I am surrounded by guys my age at school and I have a twin brother. I cannot foresee a guy being that crazy over a girl. I am satisfied with the way the book ended and how Travis came to terms with everything. The concept for this book was interesting and it was interesting to see how each person dealt with Travis being alive again. However, the ending left you wondering where the rest of the book was as there was no closure.